The safe place to position your drive is to the right hand side. Majestic, tall trees are lurking – however, this is a gentle hole and after a reasonable tee shot (with possibly a fairway wood for the longer hitters) a short iron should find the green. A long / medium iron shot to a well guarded green. If the pin is on the right hand side it may be better to avoid temptation and to play safe to the left side of the green. This hole requires a tee shot of around 200 yards to the right hand side of the fairway. Anything to the left will leave a second shot that will have to carry one of two large, strategically placed, Beech trees and a bunker which guards the front of the green. Drive too far and you may well be blocked, or too near the trees to be able to carry them. Avoid the bunkers off the tee and make sure your second shot is long enough as there is some distance from the front bunker to the centre of the green. A good drive will leave a short iron to the green. No bunkers guard the green but anything short and left will run away from the hole leaving a difficult chip. This is one of the longest holes in the South of England. A long drive is necessary but even more important is the line of the second shot. A large Beech tree needs to be carried, bunkers are down the left side of the fairway and go too far right and you will have a difficult third shot – over some deep bunkers. No prizes for being short here. This hole plays slightly uphill and against the prevailing wind. Tall Pines have to be carried and the fairway is surrounded by bunkers. If you want to play safe, aim for the right hand fairway bunker but take a club that will leave you short of it. This is a very hard Par 4 hole. The fairway slopes to the right but the hole turns to the left. A lone Scotts Pine will block your second if you drive too far to the left. A good straight drive is what is needed here and a bold second shot. A generous fairway – so make use of this and play to the right: Too long a drive will result in your second shot being blocked out, so long hitters should play for position and try to leave a second of around 150 yards to a two tier green. A good, long drive is needed here. Being uphill this hole plays a little longer than it appears. Short and sweet: Attack the pin with a short iron. Long hitters may attempt to hit the green in two. To do this will require a good drive and a brave second. Although there are no bunkers on this hole there is trouble all around. The safe way to get a Par is to play your second up the centre of the fairway (avoiding the quarry on the right) and then hit a short iron onto the green. A great Par 3 hole needing a good tee shot. Go left and you will be in the quarry. Better to be a little long as the bank at the back of the green will stop most shots. Hit your best tee shot here. The fairway goes up in steps. It takes a good hit from the tee to enable you to see the green for your second. If you cannot reach in two, play your second a little to the right to leave an easier chip shot. This hole is stroke index one for a good reason. A good long iron / utility wood tee shot is needed here. Anything to the right will fall away and the two front bunkers are well placed. Be pleased with a par. A short Par 4 with a lot of trouble around. To play safe, lay up short of the centre fairway bunker which will leave a short iron to the green. A wide fairway to finish: To the right is the safe route. The bunker short and left of the green is quite deep so should be avoided. 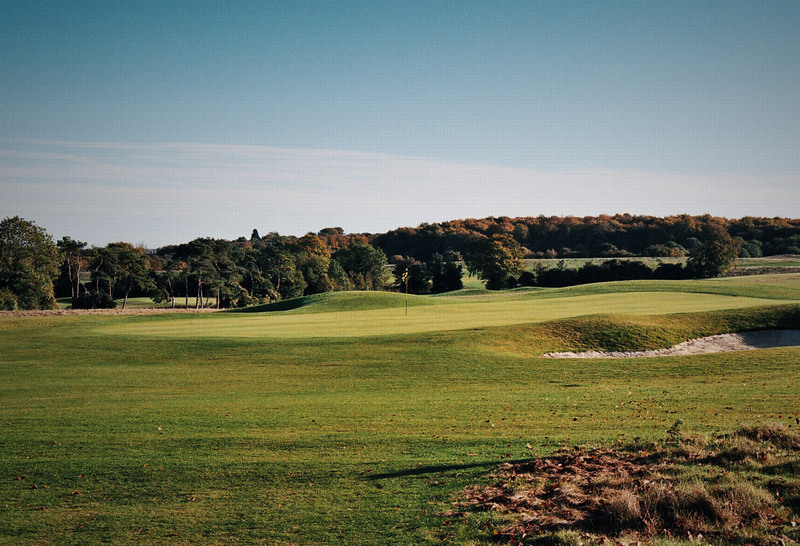 In 2008 the construction of the front nine holes of the golf course commenced on a fantastic chalk based site 5 minutes from the centre of Guildford. 2009 saw the construction of the back nine. To further improve the base, where there was no chalk primarily around the quarry, thousands of tons of chalk was excavated and those areas capped, thereby ensuring consistency of playing surface and drainage. Above and beyond this, massive amounts of earth moving took place to create great golf holes. Three large teeing areas per hole, huge greens with tantalising slopes and the brand new Sportcrete bunker system. Here at Clandon Golf we are one of the few courses with the patented, environmentally-friendly Sportcrete Bunker System. The Sportcrete material is sprayed on 50mm of specified stone installed throughout the bunker. This creates an engineered porous base that approaches the PSI strength of concrete, as well as a drainage flow rate of water tested at 2500mm of rainfall per hour, while preventing contamination from below the bunker sub soils. With our chalk based course this ensures a wonderful flint less bunker, ensuring minimum wear and tear for your sand wedge. The entire square footage of the bunker is literally a drain! In addition, the "hydraulic draw effect" created as the rainfall percolates first through the sand, then the Sportcrete base actually assists in minimizing the erosion of sand from steep bunker faces prevalent in modern design. Sportcrete for Golf Bunkers is the first and only engineered sub base for golf bunkers that will provide players with the best bunkers in the world, guaranteed!